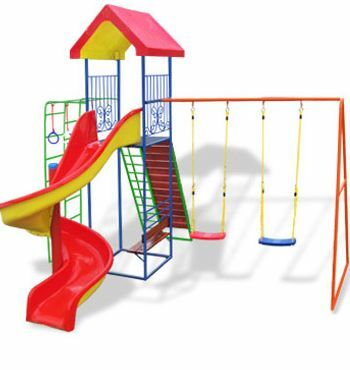 Manufacturing kids Jungle gyms and Playground Equipment - Gauteng. Choose from many different jungle gym designs and colors.We have stunning princess jungle gyms as well! What more perfect way to encourage outdoor play than to have your very own jungle gym. in the garden? No more having to rush off to the park or playground every afternoon. Now you can watch your kids play through the kitchen window, while you get their supper ready or, even better, read a magazine! The health benefits of outdoor play are numerous and well-known. Not only does it get the kids away from the mind-numbing absorption of the television, but it helps them grow, both physically and mentally. So, you want to treat your kids to a sturdy and attractive jungle gym? Good on you! There really is no better gift that you could give your children. Kids jungle gyms - metal, wooden or plastic do more than just provide the children with hours of fun. Jungle gyms and other outdoor play equipment also help to promote fitness and a balanced lifestyle from an early age. A Jungle gym encourages children to climb, swing, slide and hide, cling and do all those things that make childhood fun and children flourish. Our aim is to manufacture fun, sturdy, good quality jungle gyms and outdoor play equipment.We deliver & install in Gauteng area- Johannesburg, Pretoria and surrounds. Our jungle gyms are unique and we use a wide range of materials - a combination of metal, fiberglass, wood and plastic component are used when it comes to our outdoor play equipment.